Johannes Ritzkowsky, born in 1946 in Eschwege/Werra, studied music in Darmstadt and at the Folkwangschule in Essen-Werden. He was a prize-winner at the international music competitions in Geneva 1971 and Munich in 1973. 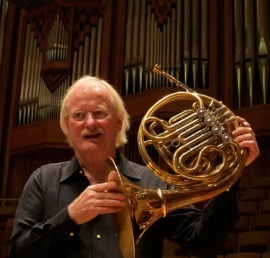 After a short period in the Darmstadt Theatre Orchestra, Ritzkowsky became solo horn player in the Radio Symphony Orchestra Stuttgart (1969–1979), later with the Bavarian Radio Symphony Orchestra (1979–2009). At the same time he taught at the music conservatory in Stuttgart, the Richard Strauss Conservatory in Munich and the Musikhochschule in Munich. He has given master-classes in different European countries, in Israel, Asia, North and South America. He is the author of different music publications and has made numerous solo recordings for radio, TV and CD.